Stadler’s new SMILE electric multiple unit, which Swiss national operator SBB calls Giruno (Buzzard), has been issued an operating licence by the Swiss Federal Office of Transport (FOT) to run at 200km/h (125mph) in single-train formations on the Swiss network. 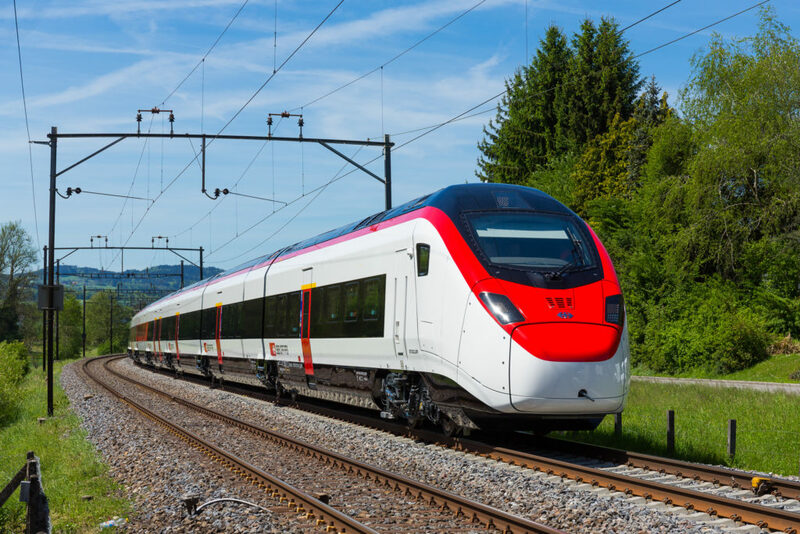 This paves the way for the Giruno to enter passenger service from early summer 2019, running through the Gotthard Base Tunnel, and the Ceneri Base Tunnel when it opens at the end of 2020, to connect Zurich with Milan and, later, Frankfurt. Originally the EC250, the SMILE received its name as the result of a competition held during an open day, an acronym of Schneller Mehrsystemfähiger Innovativer Leichter Expresszug (speedy, multi-system, innovative, lightweight express train). It is claimed by the manufacturer to be the world’s first single-decker low-floor high-speed train. The low floor provides step-free access from platforms with heights between 550mm, the standard height in Switzerland, Austria and Italy, and 760mm (Germany). Although based on Stadler’s successful FLIRT EMU design, the SMILE differs from its elder sister in many ways. It has a maximum operating speed of 250km/h (155mph), the train reached 275km/h (170mph) while testing between Hannover and Göttingen in Germany in February 2018, and iIt is designed to comply with the TSI (Technical Standards for Interoperability) High-speed regulations as well as to meet the EN 15227 crashworthiness standards. In addition, the carriages are air-tight and air-conditioned, improving ride comfort for passengers. Provision is made for passengers with reduced mobility, with wheelchair spaces and accessible toilets in both first and standard-class carriages. As ordered by SBB, each 11-car train is 202 metres long and seats 405 (117 in first class and 288 in standard). Two can be coupled together to form an 810-capacity, 404-metre-long train which can run at the full design speed of 250km/h. The train has an articulated layout, with one bogie between each carriage and one at each end – 12 in total. Four powered bogies (in positions 2,3, 10 and 11) contain eight traction motors, and power is drawn through four pantographs, a mix of 1450mm and 1950mm wide, allowing the train to run using 15kV 16.7Hz AC, 25kV 50Hz AC and 3,000V DC supplies. SBB ordered 29 trains in October 2014 at a value of CHF980 million (£632 million), with an option for an additional 92. The first train was unveiled at InnoTrans in Berlin in September 2016, just 23 months later, and the first unit was delivered to SBB in May 2017.